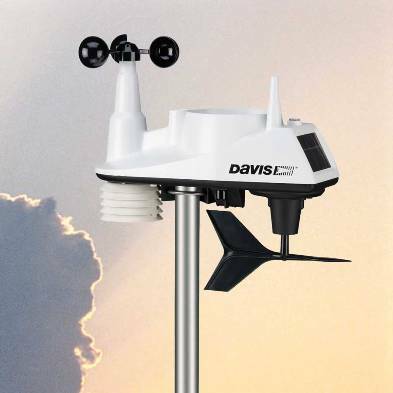 The best value for money, this wireless weather station provides accurate, reliable weather monitoring in a self-contained, easy-to-install system. Vantage Vue gives you all the weather data you need for home use, education, boating and more. Sleek but tough—your outdoor sensor suite sets up in minutes and starts sending data wirelessly to your console anywhere in your home, school, or business. You'll see current weather conditions, including indoor and outdoor temperature and humidity, barometric pressure, wind speed and direction, dew point and rainfall. You'll also get weather forecast icons, moon phase, sunrise/sunset times, graphing of weather trends, alarms and more. Vantage Vue also boasts the innovative Weather Center button that displays additional data on weather variables for today and over the last 25 days. Time & Date - including time of sunrise/sunset. Moon Phase - eight phases of the moon from new to full. Forecast Icons - know to expect sun, part sun, clouds, rain, or snow. Temperature - updates outside temperature every 10 seconds and inside temperature every minute. Rain - updates rain totals and rain rate every 20 seconds for the last 25 hours, days, months. Wind Speed & Wind Direction - updates every 2.5 seconds. Select windspeed in miles/hr, m/s, km/hr or knots. Provides the average and high wind speed for two-minute and ten-minute intervals. Retransmits - Main console can extend range to additional consoles up to 300 m.
Weather Centre - additional information such as daily highs and lows, temperature changes by the hour and barometric value changes. Also displays astronomical data such as meteor showers. Wireless - spread spectrum radio ensures consistent transmission up to 300m from integrated sensor suite to console. Durable - Corrosion-resistant cover provides durability in extreme conditions. Electronics are potted or over-molded for added moisture shielding. Radiation Shield - Provides excellent protection from solar radiation and other sources of radiated and reflected heat for more accurate temperature readings. Temperature & Relative Humidity - outside temperature readings from -40°C to 65°C. Also measures relative humidity from 0 to 100%.